If you need to setup a powerful online store quickly, choosing a hosted ecommerce platform is likely to be your best option. The benefit of hosted platforms (over self-hosted platforms) is that most of the technical details are done for you. You won’t need to choose a web hosting company, payment processor, or worry about your site’s security. You’ll also be able to create a beautifully-designed website by choosing a design that you like and clicking ‘install’. This means you won’t have to worry about hiring web designers or learning how to code. So, if a hosted ecommerce platform sounds like what you’re looking for, the next question is which platform is best? We’ll jump straight into our review of Shopify in a moment, but in case you’re looking for a quick side-by-side comparison of these five service’s pricing, you can go straight to that section here. With over 120,000 customers, Shopify are without a doubt the most popular cloud-hosted ecommerce platform, and with good reason. Shopify stores are beautifully designed, have strong technical infrastructure, and their platform makes setting up a professional-looking store extremely easy. While their main product is, of course, an online store builder, Shopify also support offline selling with a point of sale (POS) system that tracks your orders and prints receipts with a nothing more than a barcode scanner, receipt printer, and iPad. While there are a few downsides to using Shopify, it’s generally the best choice for 99% of merchants looking to sell their products online. Let’s have a deeper look into some of the pros and cons of using Shopify. Beautifully designed responsive themes – Designing a Shopify store is as easy as choosing a ‘theme’ and clicking install. 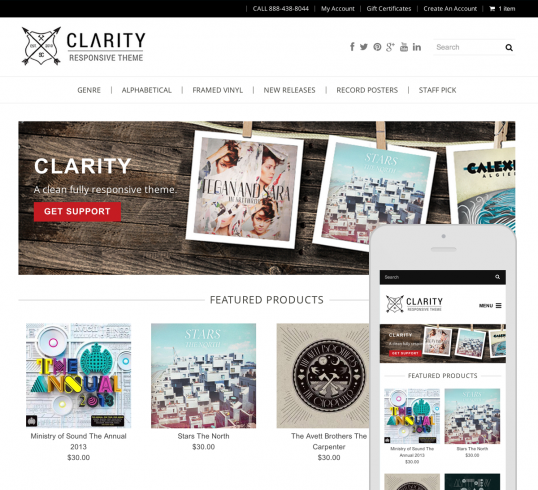 All Shopify themes are fully responsive, enabling them to look great on mobile and tablet devices. 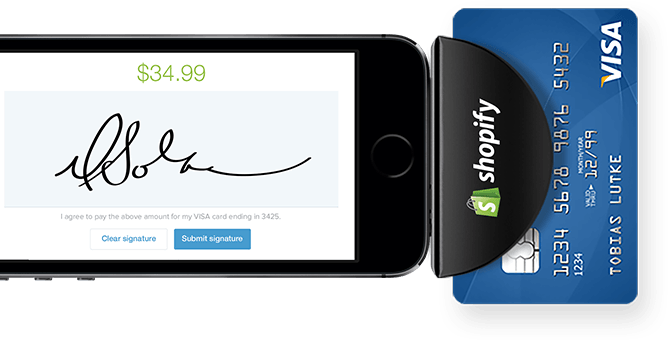 Shopify Mobile App & Credit Card Reader – Shopify have their own credit card reader that plugs into your iPhone and allows you to accept credit cards on the go. The Shopify mobile app also allows you to track your sales from a mobile device, manage inventory, fulfill orders, and much more. Surprisingly good SEO – While it does vary to some degree between themes, the quality of Shopify’s technical SEO is surprisingly good, making it easier for you to generate traffic from search engines. From little things like using microformats and rich snippet markup, to being mobile-friendly and optimised for page speed, Shopify have given store owners a head start in generating search traffic to their stores. Optimised for speed – For ecommerce sites, any page that takes more than two seconds to load is likely harming your conversion rate. By default, Shopify stores are optimised with CDNs, Gzip compression, browser caching, and a bunch of other best practices that help your store load faster. After testing about six different Shopify themes for page speed, I found that most loaded within 0.9 – 1.6 seconds, which is quite good. Good security – Shopify is level-1 PCI compliant, meaning you don’t need to worry about the security of your customer’s credit card data. All transactions and credit card details are processed securely with 256-bit SSL encryption (the same level of security used by banks). On top of this, your store is automatically backed up daily, and has several features to prevent hackers from attacking your website. Easy to set up – While Shopify does have a bit of a learning curve, it’s easy to setup, add products, and customise without needing to learn any coding knowledge. Marketing tools – One of my favourite features about Shopify is their focus on helping store owners market their services and generate traffic (and sales) once they’ve built their store. From giving store owners $150 worth of Facebook Advertising & Google Adwords credit for free, to encouraging social media integration and email marketing, Shopify makes it relatively easy to start attracting potential customers and closing sales. 24/7 customer support – Another area that Shopify scores big points on is educating their customers and providing exceptional support. From their online ecommerce University, to discussion forums and 24/7 live chat, phone, and email support, you’re in good hands. There aren’t many bad things to say about Shopify, though I’ve outlined a few considerations that are good to know before you become a customer. Hard to migrate away from Shopify – If you ever decide to close your Shopify store, you’ll lose all of your data with it. Instead of allowing you to download your data or transfer it to another provider, Shopify permanently deletes all of your data when you close an account. Price creep with third-party apps – Shopify has over 920 apps that you can use to upgrade the functionality of your Shopify store. From integrating accounting software, to setting up a reward program, these apps give you near-limitless potential to grow and customise your store. The downside is that many of these third-party apps cost a small monthly fee, which can quickly add up to a sizeable ongoing fee. At the same time, these apps can help you sell more products, so it’s likely that the ongoing cost of installing them would be justified by the additional revenue they generate – and if they don’t, you can just uninstall them. Non-standard coding – If you want to make quick HTML changes to your Shopify site, you might run into a few difficulties. Shopify is based on their own language called Liquid, which means that if you want to make coding changes to your site, you might need to hire a Shopify expert who is familiar with Liquid. Not the most affordable option – While there’s not a huge discrepancy in price, Shopify is not the cheapest hosted ecommerce platforms. The team behind BigCommerce have been building shopping cart software since 2003. While the first 11 years was spent building the self-hosted ecommerce platform, Interspire, this was discontinued in 2012 to focus entirely on BigCommerce. As of 2015, BigCommerce now hosts over 55,000 online stores that have collectively sold over $4 billion worth of products. While not as popular as Shopify, BigCommerce is still widely considered one of the best ecommerce platforms. So, what edge does BigCommerce have over Shopify and the other platforms? No transaction fees on large accounts – Unlike Shopify and 1ShoppingCart, BigCommerce don’t charge transaction fees on their plans above $79.95/month. While their starter plan is relatively pricey, BigCommerce is one of the most affordable options for medium-large ecommerce websites. Beautiful designs – In 2014, BigCommerce released a large range of modern responsive themes to choose from. Out of the five services reviewed here, these are some of the nicest looking themes to choose from. Conversion optimisation features – BigCommerce have a range of features designed to give your store the highest conversion rate possible. From a single-page optimised checkout design, to side-by-side product comparisons and recommendations, they’ve clearly put a lot of thought into helping customers squeeze the much value out of their traffic. One of the most interesting features they offer is their abandoned cart saver, which sends a series of emails to shoppers who left their cart while shopping on your site encouraging them to come back. According their results, this converts an average of 15% of abandoned carts into sales. SEO & multi-channel marketing – BigCommerce do an exceptional job of making their stores SEO friendly. Their themes are well-coded, fast, cross-browser compatible, fully responsive, and easy to integrate with Google Shopping, and display rich snippet markup. BigCommerce also enable multi-channel marketing, by allowing integration with third-party sites like Ebay, Facebook, and product comparison sites. Based on HTML & CSS – Unlike Shopify websites, which are built on Shopify’s own ruby-based language, BigCommerce websites can be customised with basic HTML and CSS, making it both easier and more affordable to make coding changes to your site. Not the best customer support – After reading through several customer reviews of BigCommerce, it’s apparent that their customer support might have a few issues. While this is quite subjective and seems to have been addressed (they used to get a lot of flack for not having 24/7 support, which they began to offer in 2014), it’s something to bear in mind. Not as many third-party apps as Shopify – The BigCommerce App Store has ~150 apps, from email marketing integrations to automatic label printing software. While this is likely to be comprehensive enough for 99% of users, it’s nowhere near as many apps as Shopify have in their app store (920). With no transaction fees and five different pricing tiers starting at $19.99, 3dcart are one of the most affordable hosted ecommerce platforms out there. While I wasn’t overly impressed with the quality of their store designs, 3dcart has an enormous range of features and options to customise your store. Great pricing & no transaction fees – Apart from Volusion, 3dcart are the only other hosted ecommerce platform to not charge any transaction fees. Combined with their lower ongoing fees, this makes 3dcart one of the cheapest options out of the five. A huge range of features – While the range of features offered by 3dcart is borderline overwhelming, it does mean that most store owners will be able to manage all of their online activity in one place. 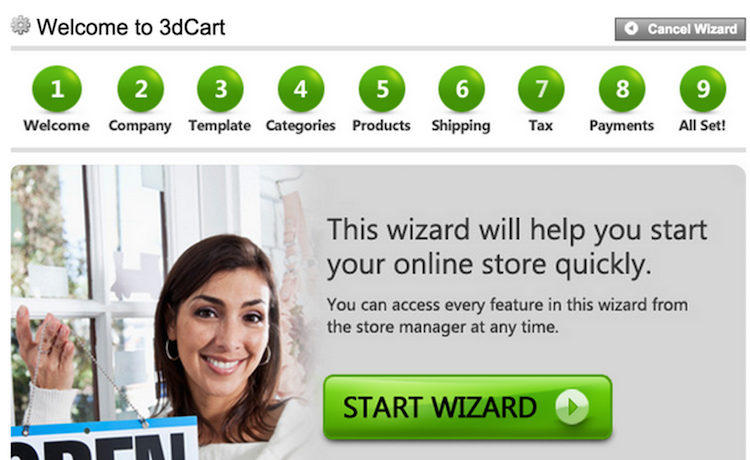 From social commerce tools to their own CRM, you’re spoilt for choice with features on 3dcart. Their templates need an update – While their templates aren’t bad, they’re pretty average. The majority aren’t responsive, and even their premium templates (which cost $99-199) are only just on par with many of the free themes offered by their competitors. 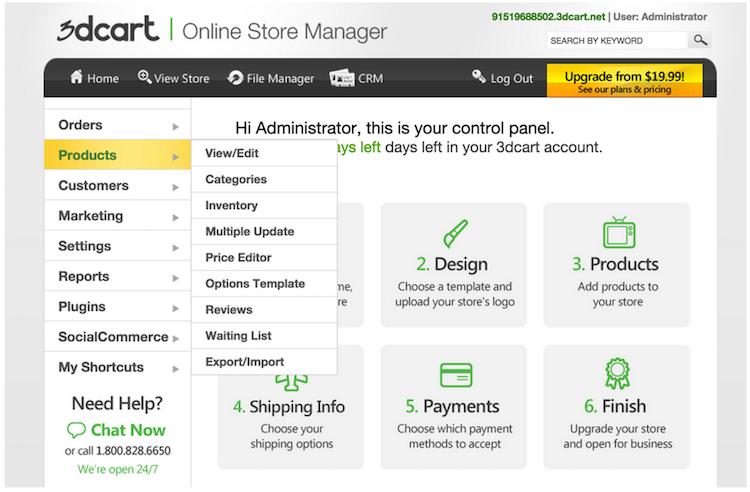 Unintuitive admin panel – Compared to Shopify and BigCommerce, the 3dcart admin panel feels very dated, overwhelming, and hard to navigate. With 9 navigation items that each have 5-10 sub-navigation items, it’s easy to get overwhelmed or lost while figuring out what you’re looking for. Overwhelming setup process – While it doesn’t take too long to get setup on 3dcart, their onboarding process includes nine steps, which I feel could be broken into fewer steps, or restructured to ask for information at different times. Overall, I wasn’t enormously impressed with 3dcart, but I can definitely see how they’d be a great option for people who want to manage everything in place, or who’re looking for the most affordable option. Used by companies like National Geographic and Nalgene, Volusion are another big name in the hosted ecommerce platform market worth considering. Volusion iPhone & Android Apps – The Volusion app is beautifully-designed and gives you a quick snapshot of your inventory and sales reports. Similarly to the Shopify app, you can also process payments on the go from it. Unlike Shopify, who only have an iPhone app, Volusion also offer an app for Android users. Beautiful ecommerce templates – The Volusion templates are extremely well-designed, and on par with those offered by BigCommerce and Shopify. As of the time of writing, there are 359 templates to choose from, ranging in price from free to $895. No transaction fees & low payment processing fees – Thanks to a partnership with Stripe, Volusion have the the same low payment processing fees (2.15%) as Shopify. Where Volusion get a little bit more competitive is that they don’t charge any transaction fees whatsoever, so 100% of each transaction (minus the payment processing fee) is yours to keep. Deal of the Day Feature – Urgency is one of the most powerful ways to increase a product’s conversion rate. With Volusion’s popular Deal of the Day feature you can easily run 24 hour sales to keep shoppers returning to your site and making impulse purchases. You need to buy an SSL certificate separately – While Volusion do seem very competitive in their pricing at first glance, they don’t include an SSL certificate, which will set you back at least $89/year. While none of the other services reviewed here provide a free SSL certificate, most do allow you to host your checkout on a secure subdomain e.g. checkout.shopify.com at no charge (allowing you to process payments securely without needing to pay for an SSL certificate). Certain features are only available to higher-paying customers – While it’s normal for companies to unlock features for higher paying customers, Volusion only enable certain features like phone support, CRM and import/export functionality to higher-paying customers. Created by Web.com, 1ShoppingCart is one of the most established ecommerce platforms with over 3 million customers. As given away by their name, 1ShoppingCart is primarily a shopping cart. Combined with the webs.com website builder and a few other features – like email autoresponders, an affiliate program builder, and a basic CRM, 1ShoppingCart has become a relatively powerful hosted ecommerce platform. While their website and service isn’t quite as slick as competitors like Shopify, their track record definitely earns them a spot in any comparison of the best ecommerce platforms. So what are the pros and cons of 1ShoppingCart? Cross-sells & Post-sale upsells – 1ShoppingCart makes it easy to cross-sells related products and add up-sells on your cart and checkout pages, boosting your average transaction value. Affiliate management – One area that 1ShoppingCart does extremely well is enable you to manage a powerful affiliate program. With discount codes, coupons, and integration with your email autoresponders, you can easily incentivise affiliates to promote your products for you. Mediocre Designs – Similarly to 3dcart, their store template aren’t bad but they’re just not what you’d expect to see from a modern ecommerce site in 2015. To give them credit, their templates are responsive, and have clearly been built with conversion optimisation in mind. Expensive – 1ShoppingCart is the most expensive hosted ecommerce platform out of all those we’ve reviewed. With a starter package that costs over twice as much as Shopify’s similar basic package, and a $249/month fee for their ultimate package, 1ShoppingCart clearly doesn’t compete on price. On top of this, their transaction and payment processing fees are also quite steep relative to the others. There are three main costs to take into account when choosing a hosted ecommerce platform: the ongoing monthly account fee, the transaction fee, and the payment processing fees. Payment processing fees are what you pay to a company like PayPal or Stripe for being able to accept a customer’s credit card payment. The transaction fee is a percentage of each sale that the ecommerce platform takes out of each sale you make. While payment processing fees are fairly consistent across the board (2.1 – 2.9% per transaction), monthly account fees and transaction fees vary a lot. As most ecommerce platforms have tiered pricing, I’ve compared the prices of each service for a range of different stores sizes below to give you an idea of how much each service would likely cost. There is no ‘one-size fits all’ hosted ecommerce platform. The best platform for you will depend on your budget, and specific feature requirements. For brick-and-mortar businesses that want to build an online presence, Shopify are likely to be the best option, due to their POS system and excellent infrastructure around mobile payments. If you’re on a tight budget, 3dcart will likely be the most cost effective option over the long run, particularly when you take into account their lack of transaction fees. And if you don’t think a hosted eCommerce platform is right for you – you can always host your own by choosing a web host and installing some software like Magento or WooCommerce. While I hope this comparison has helped you narrow down the options, I do recommend setting up a free trial account with two or three different options and finding out for yourself which platforms are the best fit for you. Full Disclaimer: I’ve not personally used all of the services reviewed in this post beyond their free trials. While I did spend quite a lot of time setting up mock sites and running my own tests, some of the information in this post is based on previous customer reviews and claims from the service’s websites. Also, some of the links in this post are affiliate links, which means we receive a small commission if you decide to sign up with a service through our link. It doesn’t cost anything extra to you, and it helps us to justify spending 15+ hours researching and writing in-depth posts like this one, that will hopefully save others from having to doing the same. I joined my new employer in March this year and my experience of BigCommerce has been fairly disappointing to be honest. I haven’t seen any real improvements to issues that their customers have been asking for. Their ideas section has great ideas that were meant to be in beta but never saw the light of day. Their Google Product Feed does not list variants. Support some how deleted two products and left two dud test products they created live on our website. No unique coupon code creation and there is no way of excluding products/categories/brands,you can only add categories/products (you can’t add a brand). Obviously, no one platform can tick all the boxes, but I really feel that BigCommerce are failing their customers with the lack of technical, structural improvements to their platform. One platform you missed, as I myself did until recently when reviewing other hosted carts, is AmeriCommerce. I haven’t had a chance to test it but it looks like it ticks a lot of boxes with lots of options and features baked in to the platform, and is reasonably priced. 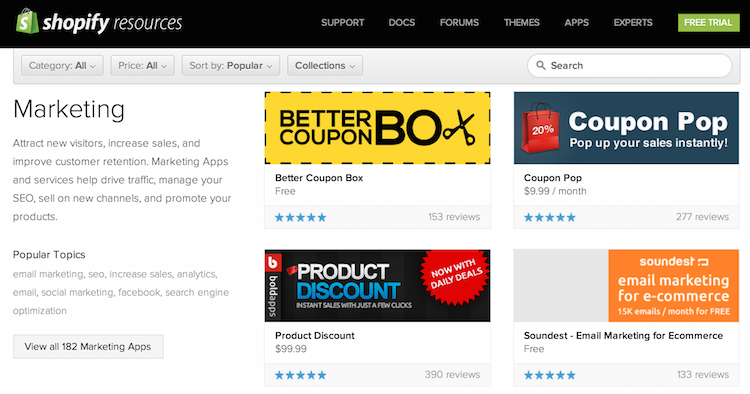 Hey Marcus, great write-up there and great to see all the pricing options side-by-side. I could imagine this to become a main read for fledgling online entrepreneurs! Great job Marcus, but you missed two very known e-commerce platforms in this article, that are being recommended by many bigger magazines like forbes and inc – These are yokart and woocommerce. Will appreciate it you will review both of these platforms in your post.